My family and I are beginning to be back amongst the living. After fighting a terrible stomach virus, things are starting to get back to normal. Our baby is eating more normal type food while my wife and I are selective as to what we are having. Our eldest daughter is still fighting the effects of the virus, but hers hasn't been as severe as the three of us. Let's look at this weekend's weather in Cookeville, TN. The sun is trying to make an appearance this afternoon (Friday). We do anticipate a few snow flurries tonight as a 'pool of moisture' (according to the NWS Forecast Discussion) swings through our area. Dry weather is expected for the rest of our weekend along with warmer temperatures. High of 46 on Saturday and 55 on Sunday. Count on sunshine for both days. 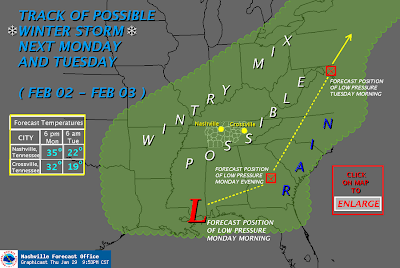 We are watching the potential development of a major winter storm for Monday and Tuesday. The biggest question at this point is this: 'Who gets snow and who gets a big, fat disappointment?' Confidence is high enough, right now, for us to see snow here in Cookeville. I'm not confident enough to tell you how much accumulation we are talking about. This graphic-cast shows the track of the low pressure system through Alabama and into middle Georgia.This is a perfect scenario for an accumulating snow for Middle Tennessee. Higher confidence in our accumulation amounts will be available LATER this weekend. I'll have more later on this impending winter storm. Glad to hear you are better. Snow forecast looks promising! I hope so too, Edd. Thanks Chris and JieRou...definitely feeling better...our little girl is still struggling a bit...she'll be better soon. We're believing for a big snow come Monday! Somewhat concerned the low pressure system may push a little too far south though.